WHAT MAKES US HAPPY Many words can be used to describe happiness: contentment, satisfaction, well-being and pleasure are a few. TIM GILMER speaks with fellow wheelers Randy Alexander, Teal Sherer, Alice Wong and Jen Goodwin, plus shares his own story in this uplifting story that celebrates family, relationships and vocations. WINTERTIME FUN Ah, winter … time to break out the mono-skis, bi-skis, XC skis and snowmobiles. BOB VOGEL shares the hows and wheres. YOGA SERENITY Instructors like PATRICE PRIYA WAGNER are organizing to make yoga more accessible and more widely available. BUYING YOUR FIRST HOUSE MARK BOATMAN shares every step, from choosing the right property to renovation and modification tips. PERSONAL ASSISTANCE PRO TIPS Finding quality programs and workers is hard. Good thing MIKE COLLINS is here to help. Health Care Gets Easier: Finally, a Home Wheelchair Scale; Melio’s Self-emptying Leg Bag. HOT AIR BALLOONING Just because you use a wheelchair doesn’t mean you can’t enjoy flying high in one of the oldest forms of air travel. FASHION TIPS FROM A PRO Can’t find clothes that work with your wheelchair? KATE MATELAN helps you find the right solution and breaks down accessible fashion myths. INTER-ABLED COUPLES Relationships between wheelchair users and nondisabled people happen all the time, but what makes them work? FOUR WHEELERS, FOUR STYLES, ONE DAY Have you ever wondered how other wheelchair users organize their days? We have, too, and asked ALEX GHENIS, PAULA LARSON, IAN JAQUISS and ELLEN STOHL to let us tag along with them for one day. We go to work with them, meet their families, learn how they adapt, and see what products they use to make it all come together. NIPPING INFECTIONS BEFORE THEY BUD Conventional wisdom says to take antibiotics sparingly. What if conventional wisdom is wrong? CHASING THAT DEGREE Going to college after an SCI is different, but not impossibly so. STEPHANIE LOLLINO shares stories of students who have made it work. OUTDOOR RECREATION: YOU CAN DO IT Admit it: if you knew you could jump out of a plane and land safely and not have a heart attack in the process, wouldn’t you want to at least consider skydiving? What about paragliding, sailplane flying, and hang gliding? Soar with the eagles! Prefer water? There’s white water rafting and surfing. Skimming over treetops? Ziplining! BOB VOGEL shows us how to do all of these safely, with little or no experience. MOJAVE TALES Two different driving stories, two different eras, one scorching desert. NEW CHAIR ON THE BLOCK NM asked four wheelers to test out the stylish new WHILL. Here’s what they say. VLOGGING A primer on video blogging — whether creating or watching — plus profiles of seven prolific vloggers. KENYA’S KENNEDY Artist, philanthropist, Facebook phenom: Kennedy Nganga, a C3-4 quad, loves his art and his people. STAFF offers their take on what remains to be done. AMERICAN COWGIRL Amberley Snyder was born to ride horses. Becoming paralyzed at the age of 18 has only fed her lifelong passion. USA ROAD TRIP Two Harvard freshmen drive cross-country — from San Francisco to Boston — to get a firsthand view of accessibility. ADA PHOTO ALBUM As part of our ADA Celebration coverage, 20 photos capture key moments of ADA history, many taken by photographers with disabilities. CRISIS IN PERSONAL ASSISTANCE It is a delicately balanced equation: not just a client-worker relationship, nor simply a contractual obligation, nor only a friendly arrangement. It is interdependency to the max, and it is being threatened by the need for change. The Department of Labor wants all personal care workers to receive at least minimum wage and overtime. It seems only fair, but could it bring on more problems than solutions? SUPER EXEC Darren Brehm has figured out not only how to manage as a high quad, but how to thrive in the business world. GET TOUGH Martial Arts for wheelchair users may seem like an oxymoron, but its time has come. BUCK UP Major depression can take you down and keep you down. But there are ways you can beat it. TRANSFORMING REGAN She is bright, dynamic and articulate. But like most us, she faces obstacles in her everyday life. Often people will only see her wheelchair. While adapting to her spinal cord injury, she also had doubts, worries, and fears. What would become of her? Fortunately, being on stage, taking on different identities, had always intrigued her. So she followed her first love. RICHARD HOLICKY profiles Regan Linton, a promising actor who knows what it is like to be transformed. BATHROOM BLUES Medicare will not pay for bathroom equipment because they say it is not medically necessary. What options do we have? HANDLING ‘HELP’ They are everywhere, eager to make a big show of helping whether you need it or not. Here’s how to handle it. GIT ’R DONE If it ain’t right, you got to fix it. Stories of adaptation. DRIVING BASICS New to disability or interested in re-learning or getting certified to drive? Here are basics to get you started. HOW IT IS Have you noticed that getting the right parts and fixing a small equipment glitch can become a problematic, spendy marathon? 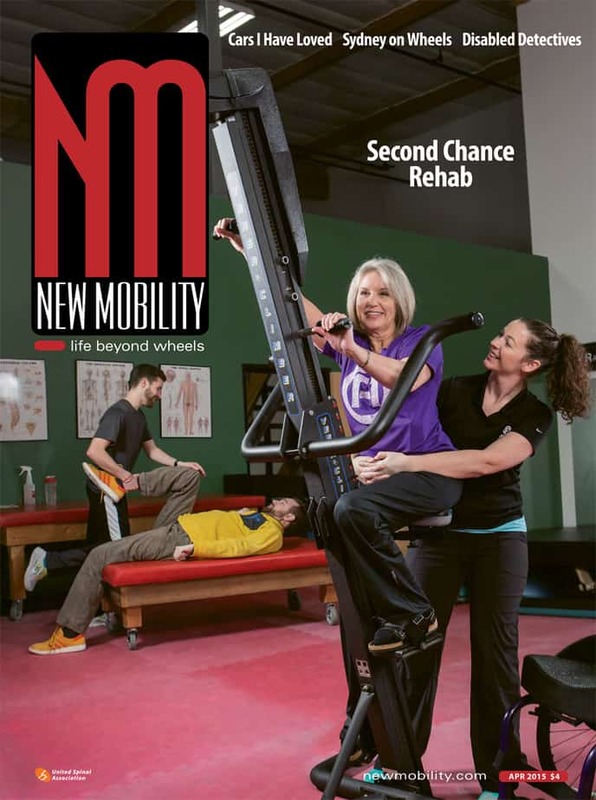 SECOND CHANCE REHAB Rehab following spinal cord injury changed dramatically in the last decade. Already-short stays got shorter as insurance companies became stingier. The good news is that more opportunities for some degree of recovery are becoming available in the fields of exercise therapy, robotics, and electro-stimulation. IAN RUDER reports on second chance rehab from the gym; RICHARD HOLICKY searches out the latest in robotics; and TIM GILMER looks to the future and emerging e-stim technology. THE CARS IN MY LIFE A love affair with cars is really a love affair with independence, according to DAVID DOWLING, who gives tribute to the vehicles that opened up his world. DISNEY UNIVERSE Disney makes magical places for children and dreamers, and more of their attractions are popping up around the globe. Disney now offers theme parks, a Hawaiian resort, cruises and international destinations for people of all abilities. While access is not perfect, it comes as close to Criptopia as imagination can conjure. ELLEN STOHL and the NM editorial staff take us to the place where we leave our worries behind. ACCESSIBLE PUBLIC SPACES We hear a lot about accessible buildings, but who is thinking about parks and monuments and other public spaces? SAILING BEYOND Kristi Hruzewicz dreamed of sailing to Paradise. One day she embarked on a journey that led to a surprising life beyond her dreams. BENT OUT OF SHAPE Let’s face it: Time and disuse do a number on our bodies. Here are some ways to get unbent. EXPLORING THE FREEDOM TRAIL A step-by-step guide to exploring our nation’s historic roots along Boston’s Freedom Trail. ROXANNE FURLONG tells the story of Brian and Tiffany, whose relationship was in trouble at the time of Brian’s accident — talk about bad timing. MITCH TEPPER, known for his past NM advice column, “Love Bites,” contributes excerpts from his upcoming book. And STEPHANIE LOLLINO writes about women turning to the Internet to find information and answers that are hard to find. WOUND CARE FROM THE INSIDE OUT An innovative doctor creates a unique patient-centered clinic with equal doses of passion and compassion. MARRIED TO THE CHAIR Three humorous anecdotes drawn from entertaining moments in the life of a wheelchair user. JOURNEY TO THE END OF THE WORLD Part Two: We ride along on the final leg of a courageous couple’s epic handcycling trip to the tip of Tierra del Fuego. PERSON OF THE YEAR When successful documentary filmmaker Jason DaSilva was diagnosed with primary progressive MS at the age of 25, his life began changing dramatically. Except, his desire to make films did not change, which led him to document his daily battle with courage and humor (When I Walk). Along the way he won awards, created an accessibility app, got married, and had a baby son. And it’s all on film. BEATING PAINKILLER ADDICTION Got pain? Take painkillers. Still got pain? Take more. But beware. The pain monster has a way of feeding on drugs. BEFORE ITS TIME The Laurent House — a Frank Lloyd Wright masterpiece — set the bar for accessible living more than 60 years ago. JOURNEY TO THE END OF THE WORLD Part One: A quad and his wife embark on an epic handcycling adventure. POSTER CHILD HAS-BEEN What ends the “career” of an adorable poster child turned teenager? Twins — two adorable poster children.